After staging a successful national food fair in August, the Department of Trade and Industry (DTI) is launching another national fair to promote and sell Filipino handicrafts under its Sikat Pinoy brand this month. “This is the second edition of DTI’s national domestic trade fairs under our newly introduced Sikat Pinoy brand,” DTI Undersecretary for Trade and Investment Promotions Ponciano C. Manalo, Jr. said. 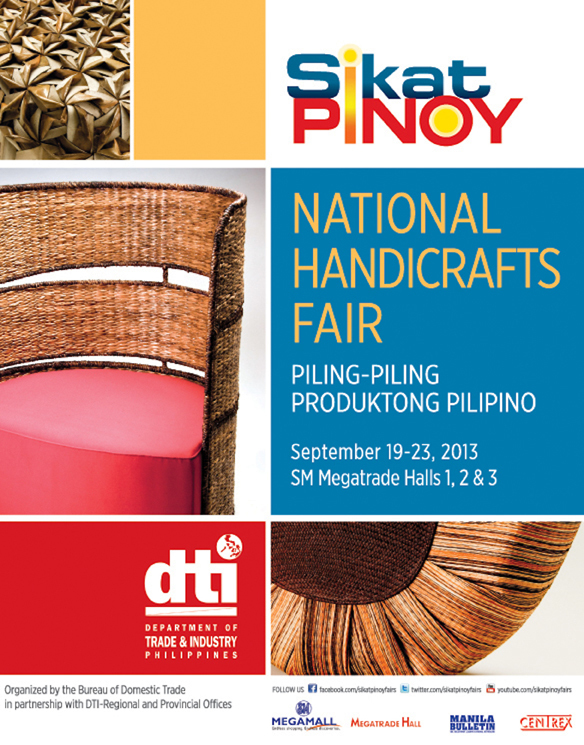 With the tagline “Piling-piling produktong Pilipino”, the DTI will hold the Sikat Pinoy National Handicrafts Fair from September 19 to 23 at the SM Megatrade Halls, SM Megamall in Mandaluyong City. “With the artistic and innovative Filipino handiworks from different regions of the Philippines available in this fair, we intend to kick off the Christmas shopping season that usually starts as early as September in the country,” Manalo said. The fair will showcase furniture and furnishings, home décor, gifts and housewares, holiday décor, wearables, accessories, and jewelry. The Sikat Pinoy National Food Fair, held last August, and involving over 250 micro, small and medium-sized food entrepreneurs from the country’s 16 regions, generated about P15 million in cash and booked sales. For more information on the Sikat Pinoy National Handicrafts Fair, you may contact the DTI through the Bureau of Domestic Trade (BDT) at 751.3223, or email at bdt@dti.gov.ph. The BDT is on the ground floor of the Trade and Industry Building, 361 Senator Gil Puyat Avenue in Makati City. You may also visit Sikat Pinoy fairs’ website at www.sikatpinoyfairs.com, or “Like” its Facebook page at www.facebook.com/SikatPinoyFairs.